Special thanks go to PoliLingua for sponsoring this post, in which I explore The Cloisters of New York City and comment on the history and languages of the Iberian Peninsula. PoliLingua offers Portuguese translation services (among many others), which you can learn about here. The company has recently added a page for translation services in Catalan as well. 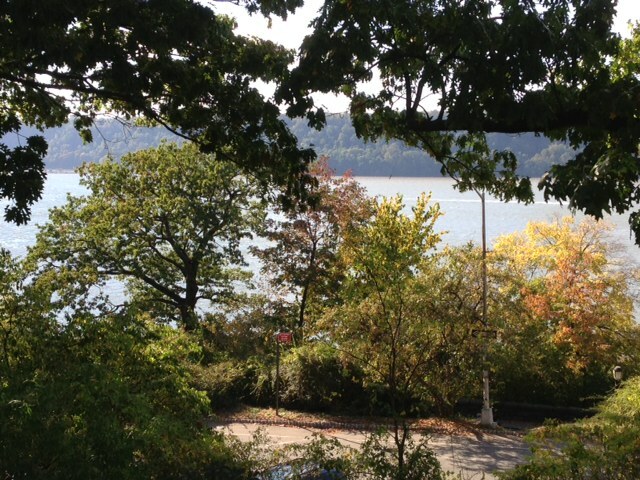 The Cloisters overlooks the Hudson River and the Palisades, cliffs and a forever wild forest preserve created with public and private funding, much of it from John D. Rockefeller. Challenging the truism that residents of a place rarely see the popular tourist sites of that place, my husband and I took the subway up to The Cloisters last month. He has been there before, but so long ago that he didn’t quite remember the way, and I had never been (at which point you may ask, “How does it feel to be a cliché?”). However, he wanted to see a concert, so off we went. Last year, Richard and I spent many days exploring the castles and convents of Portugal, so I was interested in seeing this monastery in an unlikely place – the northern edge of Manhattan. Richard told me that The Cloisters is not a single monastery but “several that had been chopped up” and brought across the Atlantic in the 1930s. The project began with a substantial endowment from John D. Rockefeller, and the site is now under the administration of Metropolitan Museum of Art. 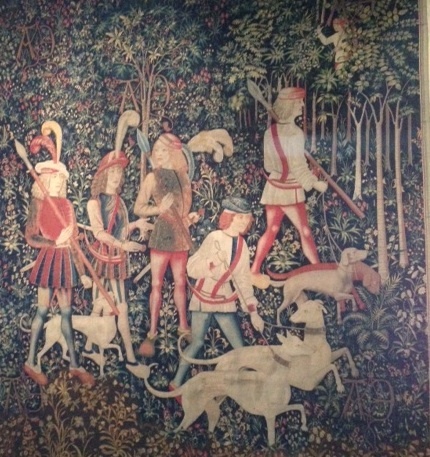 Also part of the exhibit are the famous Unicorn Tapestries, seven tapestries officially titled “The Hunt for the Unicorn” that were woven between 1495 and 1505 in the Southern Netherlands (now Belgium) as a wedding gift for King Louis XII of France. The five “chopped up” monasteries that comprise The Cloisters are of French, Occitan, and Catalan origin, in the regions north and south of the Pyrenees Mountains. 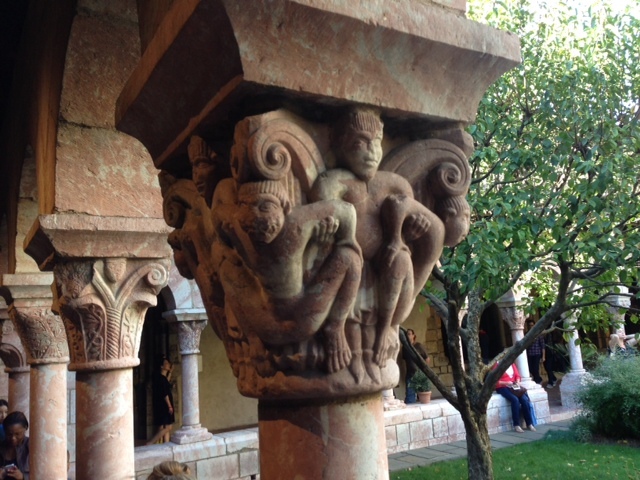 I was especially attracted to the East Arcade and the Cuxa Cloister, which came from the Sant-Miquel-de-Cuixà Abbey in Catalunya (Catalonia). The Cuxa Cloister dates from the twelfth century and features elaborate carvings in the capitals of the arches as well as a covered outdoor space for daily meetings and worship. According to an informational sign, the monastery was attacked in the seventeenth century and fell into ruin over the next two hundred years. 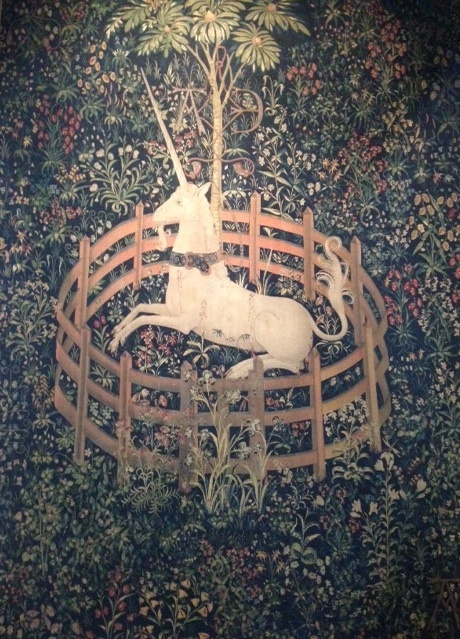 “The Unicorn Is in Captivity and No Longer Dead” — but how do we explain their extinction? The sign did not explain the reason for the monastery’s sacking. However, a clue may be found in our visitor from Lisbon in September, Luís Capucha’s, explanation for why I’m taking Portuguese this semester instead of Catalan. In the fifteenth and sixteenth centuries, dynastic unions (marriages of kings and queens) resulted in Spain’s occupation of both Catalunya and Portugal. In those days, the fates of entire populations – including their languages and cultures – rested on the alliances of monarchs whose marriages had nothing to do with love (except maybe the love of power and money). 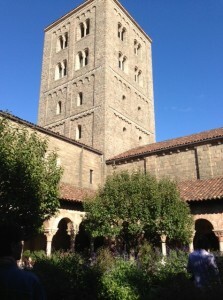 The Cloisters’ Tower from the Cuxa Cloister. Revolts in both Catalunya and Portugal in the seventeenth century tested the resources of a Spanish monarchy that had lost much in a war with England and had colonies to defend as well. Because Spain already had an outlet to the sea and larger worries about its border with France, the king and his ministers decided to let Portugal go but defend its Catalan territories. As a result, the Bragança dynasty rose to power in Portugal – and remained until 1910 – and the Portuguese language survived and flourished in Europe, the Atlantic, Africa, and South America, becoming the world’s fifth most spoken language and the most spoken language in South America. Arches of the Cuxa Cloister. The carved capitals of the arches in the Cuxa Cloister. 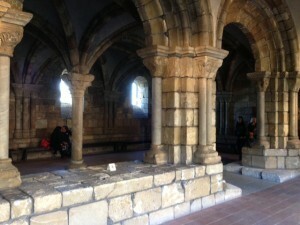 A covered outdoor meeting area for the residents of the medieval monastery. The Catalan language – along with the Sant-Miquel-de-Cuixà Abbey – experienced a very different fate. Despite aid from France, the Catalan rebels fell to Spanish forces in the Reaper’s War (1640-52) and in the War of the Spanish Succession at the end of the seventeenth century. At the beginning of the eighteenth century, the Spanish government moved to impose Spanish as the national language, an effort further reinforced by the dictatorship of Francisco Franco in the twentieth century. As a result, while Portuguese continues to be spoken widely, Catalan has struggled as a world language even with recent efforts to make it the official language of the autonomous region of Spain. 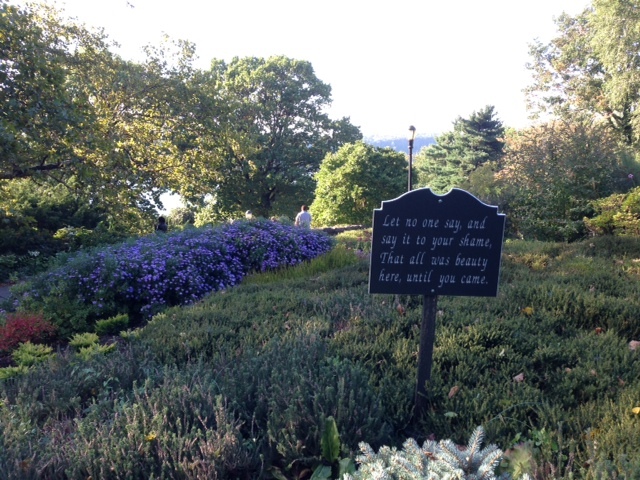 A garden outside The Cloisters and a sign with an important message. As I walked through The Cloisters, I thought of the people who had been forced to give up their buildings and their language. 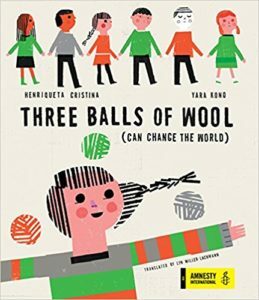 Much as we may grumble about school language requirements or flounder, unable to communicate, in another country and wish everyone there spoke English, language is an important part of how we think and who we are. When people lose their language, they lose a way of thinking, a way of feeling, a way of life. On the other hand, learning a new language offers a window into other cultures and lives and a different way of thinking about the world and ourselves. 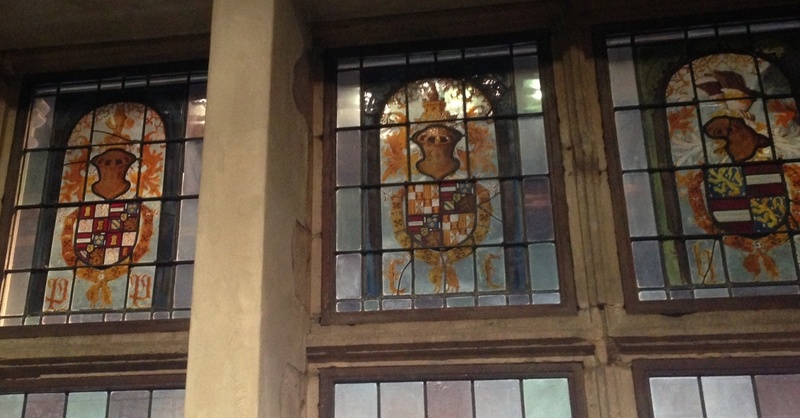 The stained glass windows of the Cuxa Cloister bear the emblems of the Spanish crown, which incorporates coats of arms from Aragón and Catalunya. 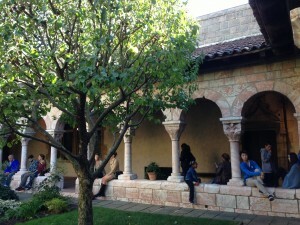 Thanks for this wonderful tour of the Cloisters. 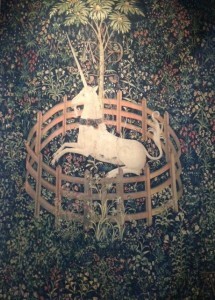 Love the Unicorn Tapestries! I’m glad you’re learning Portuguese! Thank you for your comment, Linda! The Tapestries were very impressive. When I was there, though, I made the joke about “no wonder the unicorns are extinct,” and when I came back into the room where they were displayed, some guy said to his wife and kids, “No wonder the unicorns are extinct!” I guess that’s the most common line uttered by tourists on viewing these works.